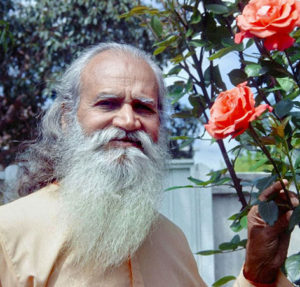 Sri Swami Satchidananda is one of the most revered Yoga masters of our time and the founder of Integral Yoga®. The popularity of yoga today worldwide is in part, due to his efforts. Sri Swami Satchidananda’s life was dedicated to peace; world peace as well as individual peace. Blending the physical discipline of Yoga, spiritual philosophy, and an innovative interfaith approach promoting harmony among all faith traditions, his work has touched the lives of millions. One person who was impacted by Sri Swami Satchidananda is Marsha Pappas. Marsha is a founding member of the IYA (Indiana Yoga Association) and Director of both CITYOGA’s and Lotus Yoga’s 200-hour teacher training programs. She completed her training at the Integral Yoga Ashram directed by Swami Satchidinanda in 1996. Since then she has been on a continuous educational yogic path while teaching yoga full time in Indianapolis and the surrounding area. Much of her focus is on the stress reducing benefits of yoga. She currently leads the Stress Management workshops in Indiana. One word to describe Marsha would be “Genuine”. Marsha has conducted over 25 YTT courses and we are happy to be able to offer this genuine quality in our YTT course at Lotus Yoga. By working together with others in a safe environment and an awareness of sacred space, we open to transformation. Marsha’s professional training and many years’ experience in teacher YTT helps guide students through the process of discovering a deeper connection with self, others, and the broader world beyond. 2019 Spring Dates will be announced soon. Plus 3-4 Weekend Intensives (dates TBD), and a Group Project. YTT at Lotus Yoga is a comprehensive introduction to the science of yoga. Designed to broaden your experience in the transformational healing path of yoga. By the end of this course you will possess a solid foundation for teaching others, while simultaneously deepening your own yoga practice. At the end of the YTT Course, graduates will be qualified to register on the National Yoga Teacher Registry (RYT200). Cost for this 200-hour comprehensive introduction YTT course is $2,950 plus a $50 (non-refundable) application fee. Credit cards and checks accepted. Please note, payment plans are also available. Participants who register with full tuition payment within two weeks prior to start date will receive a $200 discount.